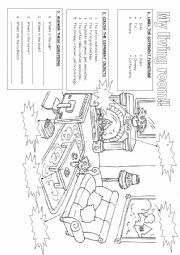 It is a worksheet where you have to guess who is who through the letters of the alphabet. You can check the clothes, the hair and the present continuous. 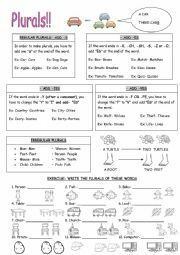 It is a worksheet where your students have to learn some informatioc about plurals, and later they have to make an exercise writing the plural of some words. 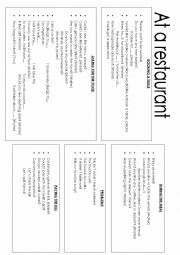 It is a worksheet where you can study or look a dialogue between a waiter and yourself in order to book a table at a restaurant, ask for the food, pay the bill or some problems that you maybe have there. 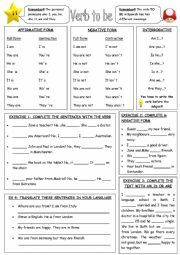 It is a worksheet where your students have to learn and study the verb to be and later, they have to do some exercises about it: answer some questions, write the verb in negative, complete a text and translate some sentences in your own language. 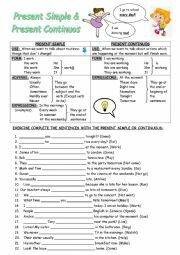 It is a owrksheet where your students have to learn the difference between the present simple and the present continuous. 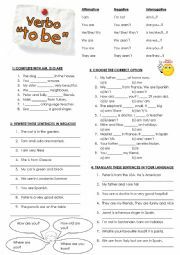 Later, they have to do an exercise where they have to write the present simple or the present continuos depend on the sentence. 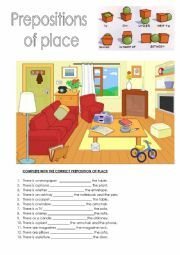 It is a worksheet where your students haver to learn the different prepositions of place, and later write them correctly looking a picture and its different objects. 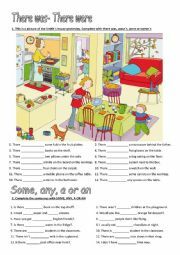 It is a worksheet where your students have to study the possesive adjectives and the personal pronouns, and later, they have to do some exercises about it.